23 Marlborough is located on the north side of Marlborough, between Arlington and Berkeley, with 21 Marlborough to the east and 25 Marlborough to the west. 23 Marlborough was built ca. 1866 for Charles William Freeland, for speculative sale, one of four contiguous houses (21-23-25-27 Marlborough). The four houses form two pairs of mirror opposite buildings (21-23 Marlborough and 25-27 Marlborough); each pair has a single entrance porch which creates a symmetrical entryway. Charles Freeland was a merchant, cotton manufacturer, and real estate developer. He and his wife, Sarah Ward (Harrington) Freeland, lived at 117 Beacon. The land on which 19 Marlborough was built was part of a larger tract of land originally purchased from the Commonwealth of Massachusetts on November 6, 1858, by George Goss. He and his partner, Norman Carmine Munson, were the contractors responsible for filling the Commonwealth’s Back Bay lands. The original tract had a frontage of 421 feet and ran from where 9 Marlborough would be built west to Berkeley Street. On the same day he purchased the land, George Goss subdivided it into smaller parcels and sold them to several different buyers who then resold the land to others. Between July and October of 1865, Charles Freeland made a series of purchases from those who had bought land originally part of George Goss’s tract. He assembled a parcel with a frontage of 248 feet where 21-39 Marlborough would be built. 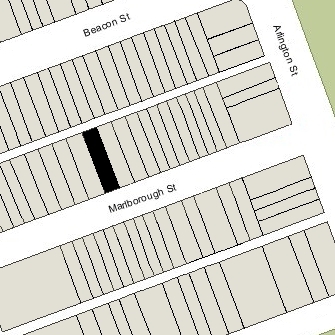 He built the houses at 21-23-25-27 Marlborough for sale to others, and sold the land where 29-31-33-35 would be built. In the case of 37-39 Marlborough, he sold the land for 39 Marlborough, but retained the land for 37 Marlborough until after the house had been built. Click here for an index to the deeds for 23 Marlborough. On November 19, 1867, 23 Marlborough was purchased from Charles Freeland by Preston Adams Ames. He and his wife, Ann Fessenden (Barnes) Ames, made it their home. They previously had lived at 48 Boylston. P. Adams Ames was a shipping merchant, banker, and broker. They continued to live at 23 Marlborough in 1874, but had moved to the Hotel Vendôme by 1875. By 1875, 23 Marlborough was the home of Rev. John Charles Phillips and his wife, Harriet (Welch) Phillips. They had lived at 74 Marlborough in 1874. Rev. Phillips was formerly the pastor of the First Congregational Church in Methuen. His father, John Phillips, was the first mayor of the City of Boston. On December 28, 1876, the New England Life Insurance Company foreclosed on a mortgage from P. Adams Ames and sold 23 Marlborough to investment banker Francis Howard Peabody. The same day, he transferred the property to Rev. Phillips. John Phillips died in November of 1878; Harriet Phillips continued to live at 23 Marlborough until her death in March of 1891. By the 1891-1892 winter season, 23 Marlborough was the home of John and Harriet Phillips’s son-in-law and daughter, Dr. Francis Henry Williams and Anna Dunn (Phillips) Williams. They had married in September of 1891 and 23 Marlborough probably was their first home together. Francis H. Williams was a physician and a pioneer in the use of x-rays and radiation for both diagnostic and therapy purposes. He maintained his office at 23 Marlborough. The Williamses continued to live at 23 Marlborough during the 1895-1896 winter season, but moved soon thereafter to 505 Beacon. 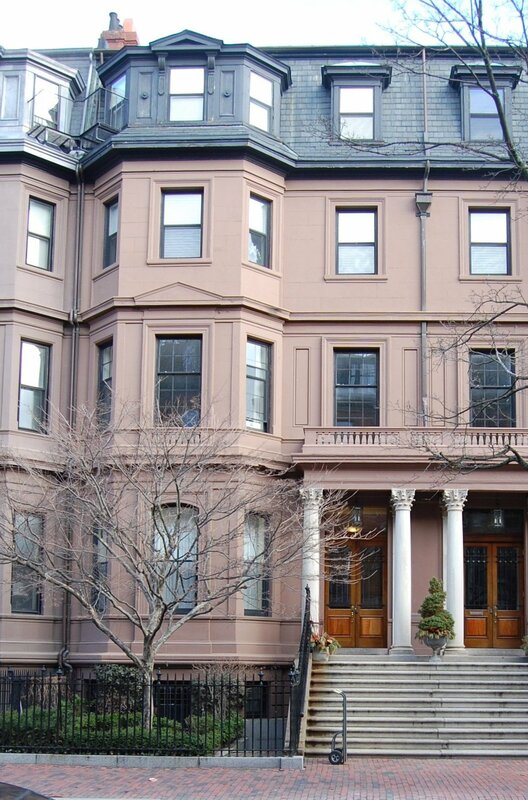 23 Marlborough was not listed in the 1897 Blue Book. By 1898, it was the home of Charles Eugène Delage (called Eugene Charles) and his wife, Marie Augustine (Isambert) Delage. He was a “ladies’ tailor” and she was a dressmaker. They previously had lived at 64 Trinity Terrace. In addition to making it their home, they operated a lodging house with several lodgers. They continued to live there in 1900. By 1905, they were living in Manhattan. By 1901, 23 Marlborough was the home of Mr. and Mrs. James I. Metcalf, who also continued to accept lodgers. On November 30, 1901, Lewis J. Bird Co., auctioneers, announced in the Boston Globe that the entire contents of 23 Marlborough would be sold at auction on December 3, 1901. By the 1902-1903 winter season, 21 Marlborough and 23 Marlborough had become a lodging house operated by Mrs. Myra E. (Allen) Stanley Stearns, the former wife of John H. Stearns, Jr., who lived at 23 Marlborough. She previously had lived (and operated a lodging house) at 4 Marlborough. She continued to live at 23 Marlborough in 1905, but had moved to 45 Mt. Vernon by 1906, where she operated the Hotel Curtis. She remained there until about 1912, when she moved to 2 Arlington. On May 2, 1904, 23 Marlborough was acquired from the estate of Harriet Phillips by architect Arthur Little. He and his wife, Jessie Maria (Whitman) Means Little, lived in Swampscott. On May 31, 1905, Eleanor May (Magee) Winsor, the wife of Robert Winsor, acquired 23 Marlborough from Arthur Little. On the same day, she also acquired 21 Marlborough. From that time, the two houses remained under the same ownership. Robert Winsor was an investment banker; he had begun acquiring property in Weston in the 1880s, ultimately becoming one of its largest landowners. Robert and Eleanor Winsor made 21-23 Marlborough their Boston home. Their primary residence was Chestnut Farm in Weston. During the 1912-1913 winter season, they were joined by Congressman Augustus Peabody Gardner, his wife, Constance (Lodge) Gardner, and their daughter, Constance Gardner, who was being introduced into society that season (including being feted at a ball hosted by her grandfather, US Senator Henry Cabot Lodge). Their primary residence was in Hamilton. The Winsors continued lived at 21-23 Marlborough during the 1918-1919 winter season, after which they made their home in Weston. On August 16, 1919, 21-23 Marlborough was purchased from the Winsors by Eleanor Vinton (Clark) Murray, the wife of Dr. Thomas Morris Murray, a physician. They previously had lived at 77 Mt. Vernon. They also maintained a home in Pomfret Centre, Connecticut. In October of 1919, Dr. Murray filed for permission to remodel the house, including adding a story to the existing rear ell. In November, he modified the plans to also add a new 23 foot by 8 foot rear addition, to the right of the existing ell. Both changes were approved by the Board of Appeal on November 23, 1919. The remodeling was designed by architect William Chester Chase. They continued to live at 21-23 Marlborough until his death in December of 1934. On March 19, 1936, the Institution for Savings in Roxbury and its Vicinity foreclosed on its mortgage to the Murrays and took possession of 21-23 Marlborough. On August 4, 1936, 21-23 Marlborough were acquired by the Katharine Gibbs School. In July, prior to finalizing the transaction, it had filed for (and subsequently received) permission to convert the buildings into classrooms and a dormitory. Katharine Gibbs School also owned buildings at 135 Commonwealth, 151 Commonwealth, 303 Dartmouth, 90 Marlborough, and 92 Marlborough. In mid-1953, Katharine Gibbs School acquired 6 Arlington to consolidate its operations in one location. In August of 1953, it sold all of its buildings except 21-23 Marlborough, and in May of 1954, it converted 21-23 Marlborough entirely into classrooms, eliminating the dormitory use. In 1968, Katharine Gibbs School was purchased by Macmillan Inc. The property was retained by the Katharine Gibbs Realty Trust. In May of 1989, Macmillan Inc. announced plans to sell Katharine Gibbs School. The School subsequently was purchased by Phillips Colleges. Probably in anticipation of (or as a part of) the sale, on June 29, 1989, the Katharine Gibbs Realty Trust transferred 21-23 Marlborough to Macmillon Inc. At the same time, it also transferred its ownership of several other properties, including 4-5 Arlington and 86 Beacon. On April 12, 1993, Robert G. Segel, trustee of the 21-23 Marlborough Street Realty Trust, purchased 21-23 Marlborough from Macmillan, Inc. 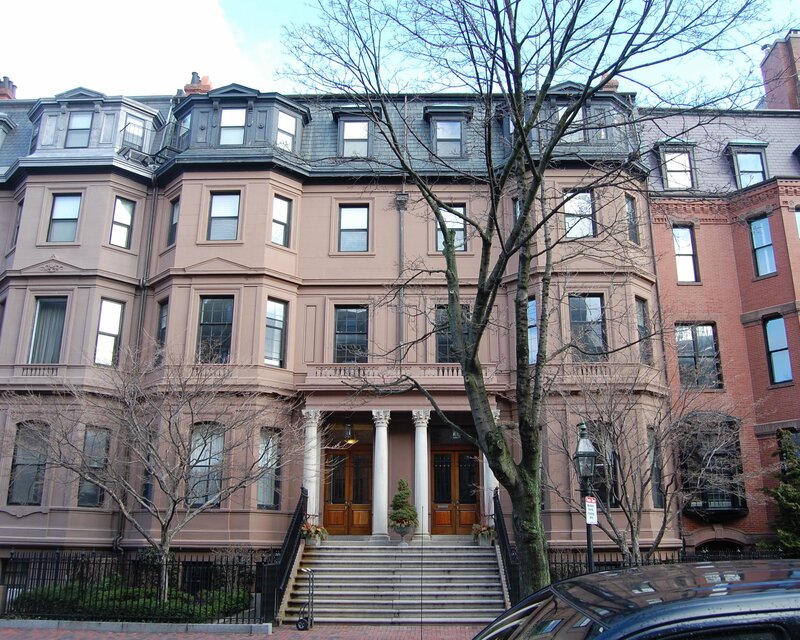 In June of 1993, he applied for (and subsequently received) permission to convert the buildings into four apartments, and on December 21, 1993, he converted the apartments into four condominium units, the 21-23 Marlborough Street Condominium.